It’s been a pretty busy winter, weather wise, here in Michigan. And I know we’re not alone. Our average seasonal snowfall total at the major airport is roughly 43 inches of snowfall, and we’re already over 75 percent of the way toward that mark, with many weeks of winter ahead of us. Here are sixteen tips to get the most of your snowblower. Prepare yourself – Whether you’re about to use your snowblower for the first time, or you anticipate using it for a forecasted snowfall, make sure everything is in working order…and that you have gas. We had a fairly significant snowfall here in Michigan over the weekend, and I saw several posts from friends on Facebook who had gone out to use their snowblower, only to discover that they ran out of gas, and didn’t have any more in the gas can. Always check beforehand. 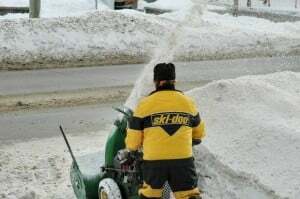 Know your snowblower – It’s good to have a working knowledge of how your snowblower operates. You should know whether you have a single stage or two stage snowblower. You should know how much snow it is rated to throw and how far. If you don’t know these things off the top of your head, you probably need to give your owners manual a run-through, as you’ll definitely come away with useful knowledge. Know your snow – Understand that there are different types of snow that will cause your snowblower to function differently from one snowfall to the next. Four inches of light, fluffy snow versus four inches of wet, heavy snow will provide you two completely different experiences, and the type of snow will move the mark in how much your snowblower can handle. If you know you’re getting a large amount heavy snow, you may want to make a run with your snowblower in the middle of the snowfall so that you don’t risk overtaxing the machine. Otherwise, you’ll find that the machine can get clogged and stall out, which can be a very unpleasant experience. Account for the wind – If you’re going out to blow snow and it’s windy, you’ll definitely want to account for the wind when making your plan of attack. You want to make sure that you don’t aim the thrown snow such that it will come right back on your driveway, which also means it’s going to fly in your face. Protect yourself and your clothing – Blowing snow can be cold work, so bundle up. Also, don’t wear your new jacket when doing so. True story, I wore a coat for the second time, got it caught in the snowblower handle, and ripped the coat as I made a turn. Ever since then I’ve been careful not to let my clothes get caught in the handle, but even so I make sure to wear old coats and other clothing. 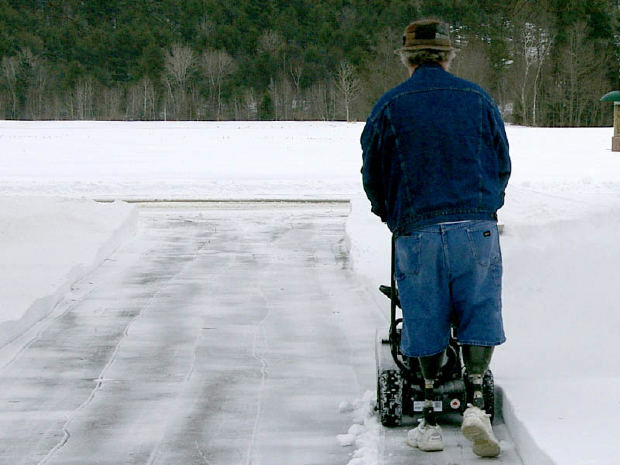 Exercise safety precautions – Never stick your hand in the snowblower when the paddles are moving. You’ll inevitably get snow jammed up at some point. Make sure that all the mechanisms are stopped before going to clear them. Those things spin fast and hard to get rid of the snow, and it’s not going to know the difference between snow and your hand. If you assume that the snowblower will hurt you, you’ll likely defend yourself to make sure it doesn’t. Mark your edges if necessary – If it’s your first snowfall or you have significant drifting, you may not have a clear edge to where you need your snowblower to go. In this case, I like to go out with a shovel first and mark some of the edges. Otherwise, I might go too far and end up with pieces of grass and dirt getting pulled up as I go too far. 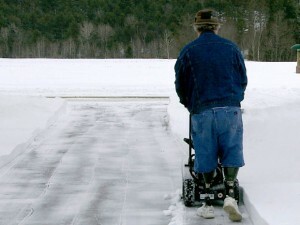 Start from the center where possible – If you are doing a driveway with space to pile the snow on both sides, start in the center with your chute blowing to one side. When you get to the bottom, you can go back up having the snow thrown to the other side. You’ll flip flop back and forth between throwing snow on both sides of your driveway, and will avoid having to keep changing the direction which the snow is directed as you move inside each way. Plan for your irregular areas – We have a side entrance garage, so for the portion in front of the doors, I can’t blow snow to either side. In that case, I have to maneuver a little bit to get this area done, in some cases I back up in a clean area then direct everything straight forward. Watch where the snow is going – If you have heavy snow and a wide area, you may find that your snowblower isn’t able to get the stuff further away all the way off of your driveway. In this case, it’s going to throw it on top of snow you still have to do. If you are already taxing the snowblower, then this will likely cause jams as you get to that area, and you may have to start from the outside in, then go back outside again. Adjust the height of the thrower – You can adjust the height depending on how far you want the snow to go. If you’re working far away, you probably want to have it thrown as high as it can so that it creates a big arc to get to the grass. When you’re closer to the edge, or if it’s really windy, you probably want to adjust this as it will create less work for the snowblower and cause the snow to blow around less. Don’t leave your snow on the street – Few things infuriate me more than when I’m driving through our neighborhood and I see a pile of snow on the road where they’ve blown it from their driveway back on the road. It’s especially bad if the plow has already come through and done the road, but even if it’s before the road, the fact is that you should never do this. It creates danger for those driving on the road, and it’s simply not courteous. I will say that I actually blow a portion of mine from the driveway onto the road, but I’ll then blow it back onto the grass as part of my next step. Reduce the mess from the snow plow – It never fails. You spend an hour blowing off the driveway, only to have the snowplow come through and leave a huge mess at the bottom of the driveway. You can reduce this mess by cleaning off a portion of the street before your driveway in the direction from which the plow comes. Generally a ten to twenty foot path is enough to make a difference. This creates a chunk of space where the plow doesn’t have to actually clear the road. This will allow the snow on the edge of the plow’s blade to dump off in this portion, and by the time they reach your driveway, there’s very little falling off the blade. It’s not a perfect science, but it can cut the amount of snow at the end of your driveway by 50-75%. Clean up the mess from the plow as soon as possible – If the plow does leave a mess, the quicker you get out there to clean it up, the easier it will be to do. The longer it waits, the heavier it will get, not to mention how the cars will drive over it pushing it down until it turns to ice. The quicker you can get out there, the better. Don’t overdo it – Remember, you’re going to be doing this work in the cold, and even though the machine is doing a big chunk of the work, your body is still taking a hit. A lot of people die every year shoveling snow, but also using snowblowers. Take it easy and don’t overdo it. Remember, it’s not worth having a heart attack for something that is just going to melt in a few weeks anyways. Clean up your snowblower – When you’re finished, try to remove snow from the snowblower. I have a broom removed from the handle that I use to brush it off. This will keep water out from where you store it, and can also help avoid the snow turning into ice if your storage area is cold, which could make it difficult to use next time. We moved into our house in 2007. Since then, the Metro Detroit area has had above average snowfalls every single season up until this winter. Having had to shovel / snow blow the driveway over the past four years, I can definitely attest to the above average snowfalls. This year, though, we’ve had virtually none, with one real snowfall to speak of just last weekend. Before that, I hadn’t had to shovel the driveway once, let alone use the snowblower. Thinking about it, I probably should have known that this would happen, since I put a significant upgrade into our driveway this past year. Ever since we’ve moved in, shoveling has proven to be a nuisance, because of uneven slabs in the driveway. Over time, some of the slabs sunk or shifted, and it always happened that the higher edges were the path that I would be shoveling. Inevitably, I’d be shoveling and the shovel would smack into the lip of the next slab. This would result in the shovel jarring to a sudden stop, giving me a near hernia (I’ve already had two operations in my lifetime) and multiple curse words. For the overall health of the driveway, I finally decided to get things fixed over the past summer. I had the sunken slabs lifted by a professional company that drilled small holes into the offending slabs and lifted them by injecting a concrete slurry underneath. I also had all of the joint cracks as well as a couple of cracks that have developed over the years professionally filled so that water does not get under the driveway. Except for the sinking, the driveway is in pretty good shape. There were just the couple of cracks, only a couple of chips here and there, and very little pockmarking across the surface. A couple of the representatives for companies that gave us bids figured that we could easily get another 10-15 years of life by taking the steps that I outlined above. So I did so. And, after the slabs were raised and everything was done, the first thing I did was grab my snow shovel (never mind that temperatures were in the 60’s) and run it across the path of where I typically shovel. Imagine my delight when the shovel didn’t hit any lips due to uneven slabs. All the work cost roughly $1,000. Some would argue that it’s a small price to pay for no snow. I figure all it did was delay the inevitable, as I predict we’ll get our normal amount of snow, just crammed into a couple months. If I’m right, I might be cussing about snow, but at least it won’t be due to the snow shovel getting knocked loose!